Make a killing with Today’s Enhanced Offer; back the biggest sides in the Premier League this weekend! Get ready for round 10 of the English top flight with Paddy Power Sports! Create a new account and place a £10 wager on Man United, Tottenham, Man City and Liverpool all to win their respective matches with Today’s Enhanced Offer 12/1! There’s £120 waiting to be claimed for a mere £10 bet on the Premier League quadruple; don’t let this chance pass you by! Bet on the four clubs before 15:00 BST this Saturday (October 29) to make some easy cash for the weekend. After that, have yourself a great party with the lads, and make sure to reinvest a part of your winnings to make even more money! Note: this offer is open to new customers that reside in the UK and the Republic of Ireland. You’ll receive your earnings – if all four sides win their games – based on the standard price on the site, while the rest of the winnings will be paid out in Free Bets, taking the full amount to the 12/1 odds. Use this special opportunity to make some extra cash with Today’s Enhanced Offer! Man City still top the table, but they’re tied on points (20 pts) with Arsenal and Liverpool, after nine rounds in the English top flight. Pep Guardiola hasn’t recorded a victory with the Sky Blues (in all competitions) since their 3-1 win over Swansea on September 24, but the Catalan remains adamant his gaming philosophy will reap benefits in the long run, despite hitting a slump in recent games. This is the first time in Guardiola’s career that he has gone six matches without a victory, and the game against West Brom this Saturday should see him go back to a winning form. 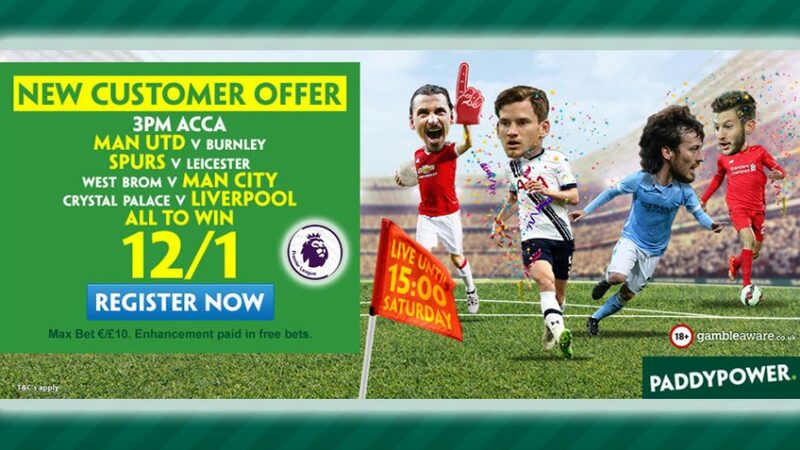 Back Man City and the other three sides with Today’s Enhanced Offer to win £120! Tottenham are merely 1 point behind the top three leaders on the table, sitting in fifth position with 19 points, while Man United are yet to find a winning formula; they’re currently in seventh spot with only 14 points from the first nine rounds in the Premier League. However, the Old Trafford boss Jose Mourinho will likely see an invigorated side against Burnley this weekend, following their 1-0 victory over cross-town rivals Man City in Wednesday’s EFL Cup match that saw them eliminated from the competition. The Portuguese will be looking to capitalize on his side’s high spirits to bring them back to their former glory. Open an account with Paddy Power today and back Man United, Tottenham, Liverpool and Man City all to win with Today’s Enhanced Offer 12/1!